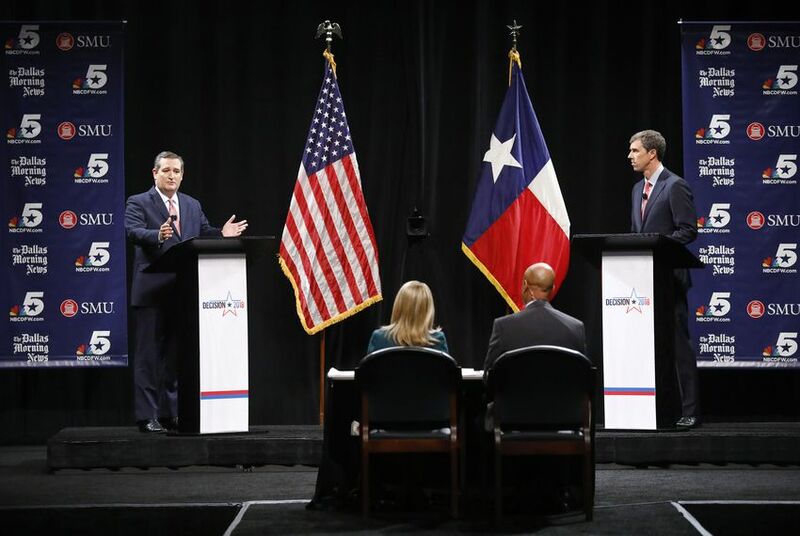 DALLAS — U.S. Rep. Beto O'Rourke of El Paso, the Democratic nominee for U.S. Senate, took a newly aggressive tack against Republican incumbent Ted Cruz in their first debate Friday evening. Appearing at Southern Methodist University, the candidates exchanged rhetorical blows on just about every single question, showing off sharp differences that have long been evident in the race. But what stood out was O'Rourke's combative posture toward Cruz after spending his campaign until this point largely ignoring the incumbent and his attacks. Throughout the debate, O'Rourke repeatedly reminded viewers that he was the only candidate on the stage who has visited all 254 counties in Texas — and forcefully pushed back several times as he came under fire from Cruz. “This is why people don’t like Washington, D.C. — you just said something that I did not say and attributed it to me," O'Rourke told Cruz at one point. "This is your trick and the trade, to confuse and incite based on fear and not to speak the truth." That exchange was sparked by Cruz's contention that O'Rourke was stoking racial hatred against police following the shooting death of black Dallas resident Botham Jean in his own apartment by white Dallas Police Officer Amber Guyger. Guyger, who was off duty at the time of the shooting, has been charged with manslaughter after claiming she accidentally mistook Jean's apartment for her own unit in the same building and thought he was an intruder. O'Rourke has voiced support for firing the officer, while Cruz has cautioned against a rush to judgment. The debate was feisty from the opening question, which was about whether "Dreamers" — young people who were brought to the country illegally as children — should be given a path to citizenship. Holding firm on his support for that idea, O'Rourke charged Cruz with promising to "deport each and every single Dreamer — that cannot be the way that Texas leads on this issue." Without denying it, Cruz shot back that O'Rourke is focused on "fighting for illegal immigrants" and that "Americans are Dreamers." Even on the ostensibly positive last question — What do you admire about your opponent? — Cruz appeared to fit in a jab, or at least a back-handed compliment. Going first, O'Rourke said that as a fellow member of Congress, he respected the sacrifice Cruz was making with his family to do what he believed was best for the country. When it was his turn, Cruz also commended O'Rourke for making family sacrifices to serve in Congress. Cruz then said he admired O'Rourke for being passionate and believing in what he is fighting for — much like Bernie Sanders, the self-described Democratic socialist, Cruz noted. "True to form," O'Rourke replied. The topic of the debate was domestic policy. It was moderated by NBC 5 political reporter Julie Fine and Dallas Morning News political writer Gromer Jeffers. In more current events, the candidates were asked about Brett Kavanaugh, the U.S. Supreme Court nominee whose confirmation is in question as he faces a sexual misconduct allegation from his high school days. Cruz said the accuser deserves to be heard and treated with respect, while O’Rourke went further, saying there needs to be an FBI investigation into the allegation. The exchange quickly turned into a broader tiff over judicial nominees, with Cruz seeking to tie O’Rourke to Hillary Clinton, the 2016 Democratic presidential nominee, and claiming they both want judges who would effectively overturn the Second Amendment. O’Rourke denied that and offered another confrontational retort as Cruz challenged him to name a judge he has supported who would defend the Second Amendment. “You may not understand how the Senate works, but it’s your job in the Senate to decide if you're going to support or not support” nominees, O’Rourke said — to which Cruz pressed him on whether he endorsed Clinton in 2016 (he did) and O’Rourke insisted the question was irrelevant. The Second Amendment fueled yet another showdown between the two as they differed on the need for gun control after the deadly shooting earlier this year at Santa Fe High School. Cruz said survivors told him they do not want gun control and instead want more armed police officers in schools. O'Rourke panned that idea, saying teachers have told him they do not believe it will make them safer. “Thoughts and prayers, Sen. Cruz, are just not gonna cut it anymore," O'Rourke said. "The people of Texas — the children of Texas — deserve action." With the moderators seeking to move on, Cruz interjected to assert that “more armed police officers in our school is not thoughts and prayers." In more personal matters, O’Rourke was asked about his 1998 drunk-driving arrest — and whether he sought to leave the scene, a detail that recently emerged about the incident that he has otherwise openly discussed. Citing state and local police reports, the Houston Chronicle reported last month that a witness said he tried to flee. “I did not try to leave the scene of the accident, though driving drunk, which I did, is a terrible mistake for which there is no excuse,” he said. Cruz said he did not “intend to get into Congressman O’Rourke’s personal history, but I will keep the focus on issues” — and then pointed out O’Rourke introduced legislation that would have effectively ended the automatic suspension of driver’s licenses for those convicted of drug offenses. Cruz and O'Rourke mixed it up over NFL players kneeling during the national anthem, which O'Rourke has defended in comments that have received national attention. O'Rourke reiterated at the debate that he believes "there's nothing more American than" such nonviolent protests, which the players say they are doing to draw attention to racial inequality. Cruz shot back at O'Rourke that "nowhere in his answer did he address" that, in Cruz's view, kneeling during the anthem is disrespectful to veterans. Players have a right to protest, Cruz added, but they can do it in a way that does not "disrespect the flag." More fireworks flared up as Cruz and O'Rourke tackled the topic of their respective relationships with President Donald Trump. O'Rourke insisted he would work with anyone who has the best interests of Texas in mind, including Trump. Cruz pounced in his response, bringing up O'Rourke's support for impeaching Trump. "As far as I know, Congressman O'Rourke has never spoken to the president other than to publicly call for his impeachment," Cruz said. "When you are leading the extreme left wing wanting to impeach ... the president, that does not set you up for policy wins for Texas." Cruz was asked whether he lost his dignity by supporting Trump after losing to him in a bruising 2016 Republican primary that saw Trump deriding the senator's wife and father. Cruz said that in an election "unlike any other," he made a conscious decision to put any personal hurt feelings aside for the good of Texans. Cruz also touted this year's income tax overhaul and job growth. O'Rourke, though, faulted Cruz for not opposing Trump more and said the president undermines American democratic institutions. "We need a junior senator who will stand up to this president," O'Rourke said. When asked how they represent Texas values, both men took the opportunity to smear their opponent based on campaign contributions. Cruz painted O'Rourke as a far-left ideologue beholden to "liberal interests." O'Rourke portrayed Cruz as someone who is "captured" by corporations and special interests. The next two debates are scheduled for Sept. 30 in Houston and Oct. 16 in San Antonio. Early voting begins Oct. 22. It was only a week ago that O’Rourke and Cruz had announced an agreement to hold three debates, capping weeks of negotiations between their campaigns. O’Rourke first challenged Cruz to six debates in May, and while Cruz maintained he was open to debating his opponent, he did not formally respond until July. That is when Cruz proposed five topical debates over three months in five cities. Among the issues that O’Rourke had with Cruz’s proposed debate schedule was every one fell on a Friday evening during high school football season. That was true for the Dallas debate, while the other two debates they ultimately agreed to are set for different days.